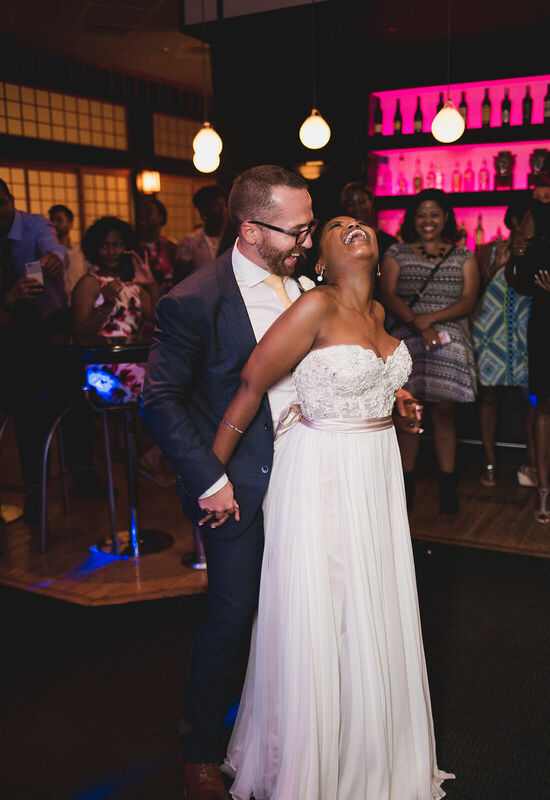 Everything was unique to their style when Brandi and Tyler Cochran were wed on August 6, 2016 in Raleigh, NC. 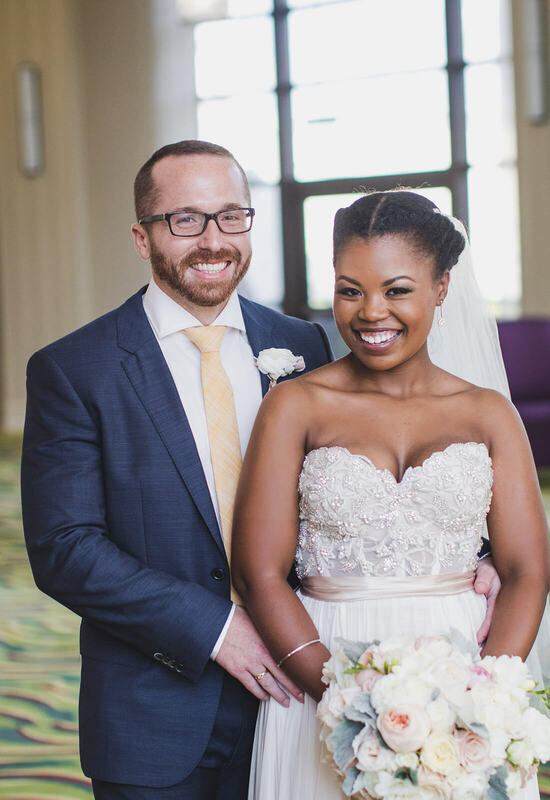 The ceremony location, the decorations, and of course the gown – all were specially chosen and tailored to fit this one-of-a-kind couple. 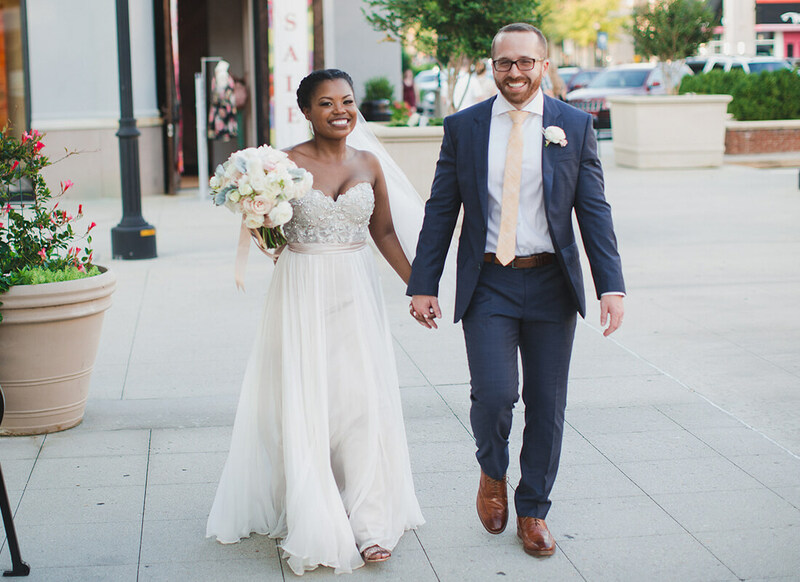 With such a different couple, it makes sense that even their trip to the Pnina Tornai Boutique at Kleinfeld Bridal was out of the ordinary. In New York for a friend's wedding, Brandi and Tyler decided that while they were in the city they would check out the famous boutique. Accompanied by Tyler and her best friend, Brandi went into the shop just hoping to have a good time – especially considering she was not even engaged yet! 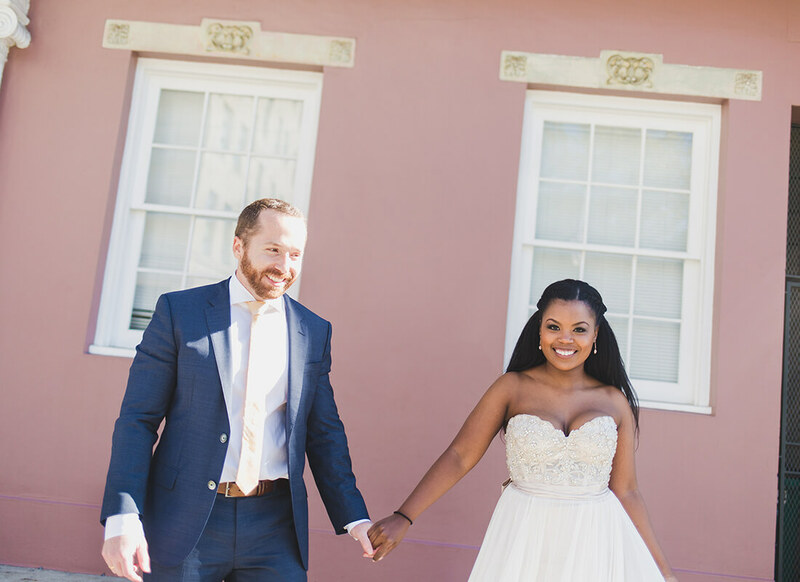 Since they had talked about getting married down the line, Brandi and Tyler figured they would take advantage of the experience while they were in the city and made an appointment at the beautiful bridal salon. She might have not been engaged yet, but Brandi did have a distinct look in mind when it came to her future wedding gown. 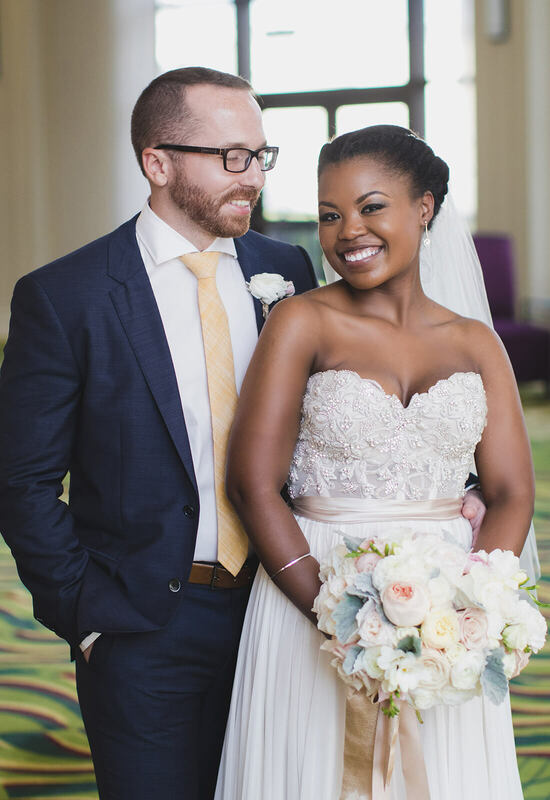 Preferring to dress “overtly feminine” to juxtapose her non-traditional personality, Brandi knew that she wanted her gown to have this same quality. She also knew that she did not want to be overwhelmed by a huge skirt since she is only about five feet tall. With these criteria in mind, her consultant went and pulled three gowns for Brandi to try on. When it came time to try on the third and last gown that the consultant had picked, it was obvious that this gown was something special. The gown was strapless with a sweetheart neckline, short underskirt, floor length chiffon overlay, and a floral crystal embellished illusion corset. The finishing touch was a pretty pink bow that tied in the front of the gown. After putting the whimsical dress on, Brandi immediately knew that this was the gown for her. Walking out of the dressing room, Brandi showed the gown to her best friend and Tyler who both loved the gown on their gorgeous companion. Luck was on Brandi's side because it turned out that she had arrived at the boutique during a Pnina Tornai trunk show! With the dress falling into her price range, Brandi decided to buy the dress on the spot with Tyler's full support. 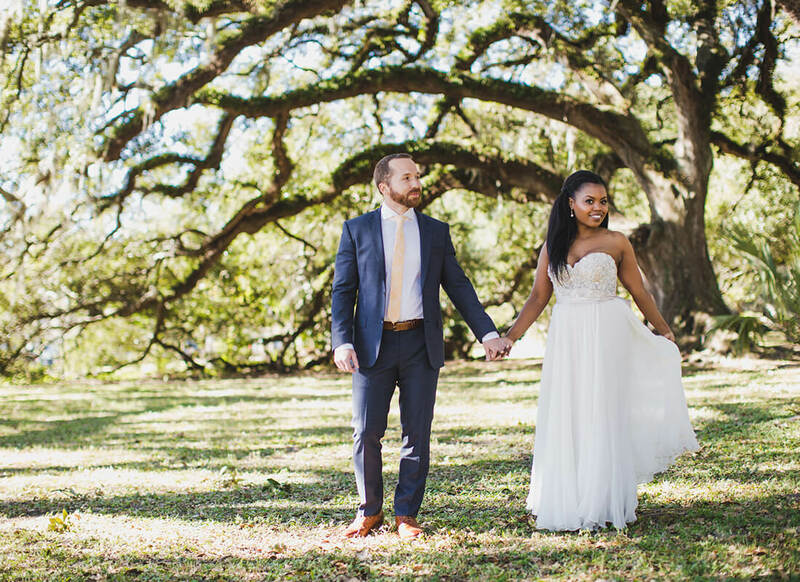 With the dream gown already chosen, Tyler proposed to Brandi the next day making their engagement and future wedding official. 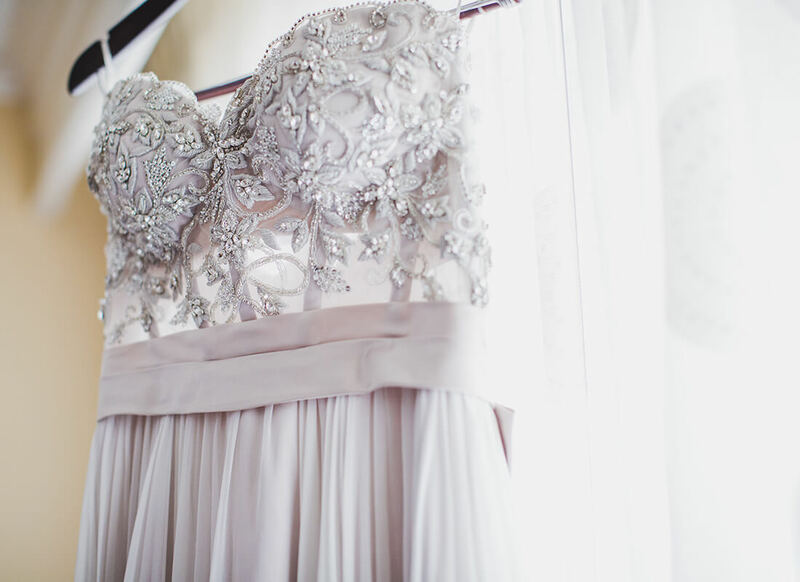 Of course Brandi had to put her own special twists on the already stunning Pnina Tornai gown. For starters, Brandi requested that the bow be moved from the front of the gown to the back so that it didn't cut off her small frame. 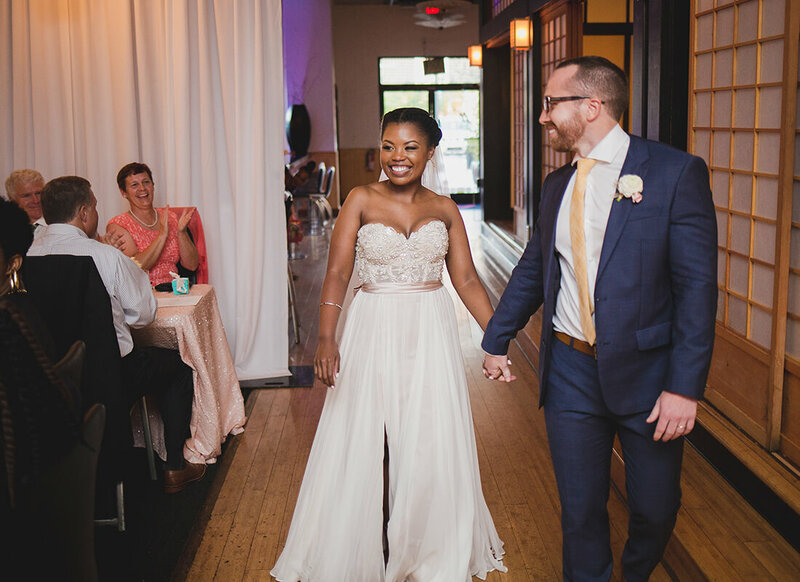 Next, instead of the short underskirt with the long chiffon overlay, Brandi had the underskirt lengthened to match the chiffon overlay and then had a slit added to match the original whimsical feel of the gown. 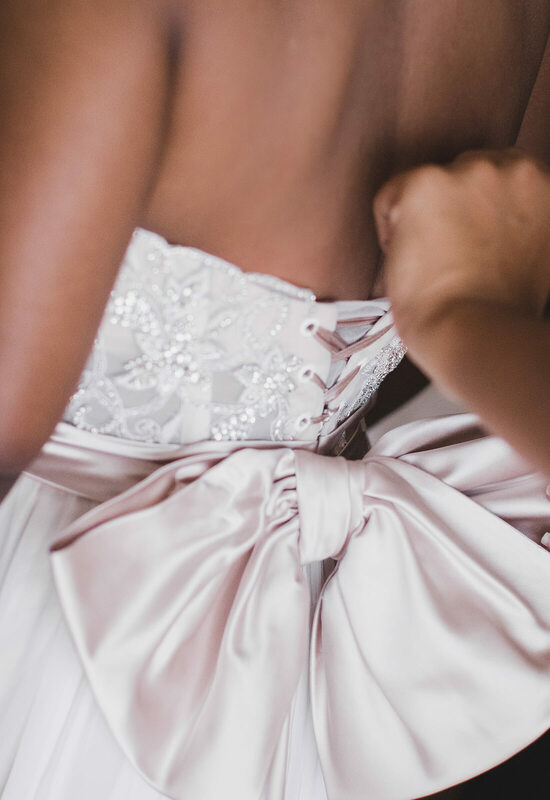 Lastly, a detail Brandi had not expected but really loved was that the initial super pink bow ended up being more of an ivory, champagne color with undertones of pink, which matched better with her bridesmaid gowns. For Brandi, this was the embodiment of her dream gown. “I loved that it was a grown-up princess gown,” Brandi reminisces. The gown was truly like something out of a grown-up fairytale. 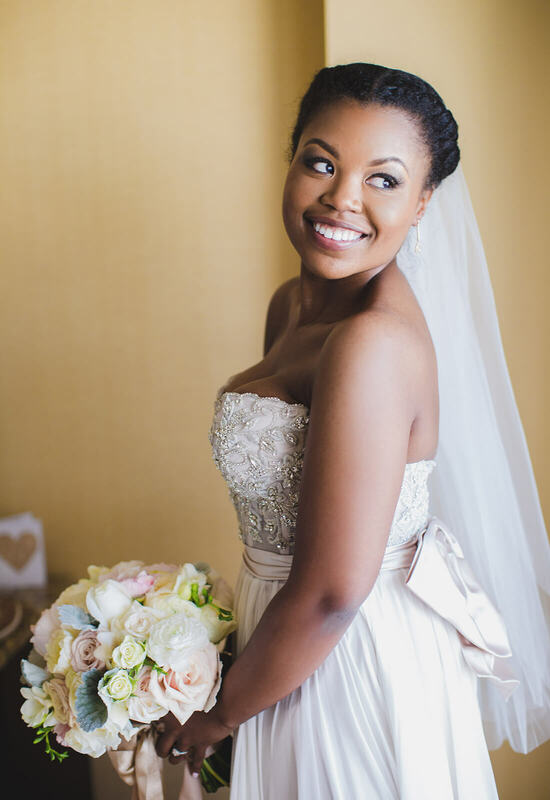 Brandi looked like a trendy and modern Barbie in her one-of-a-kind customized dream gown. 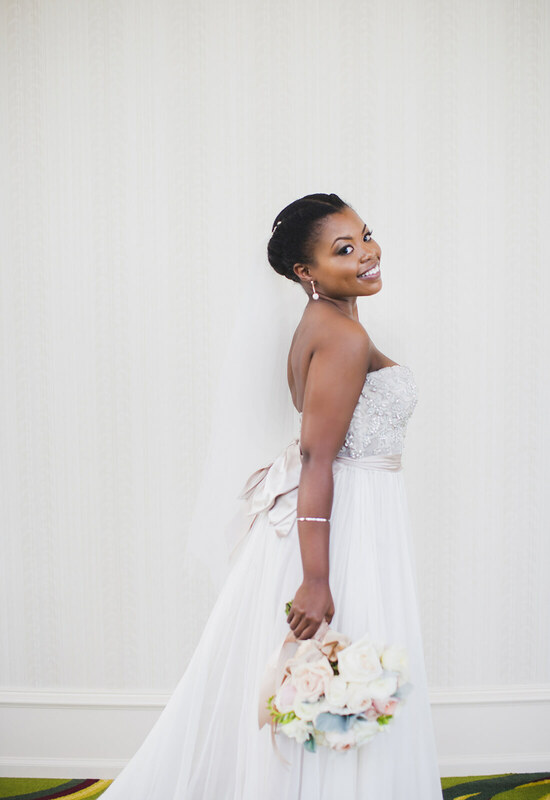 It flowed beautifully around her as she walked up to the sushi fusion restaurant, Mura, to marry her soulmate. 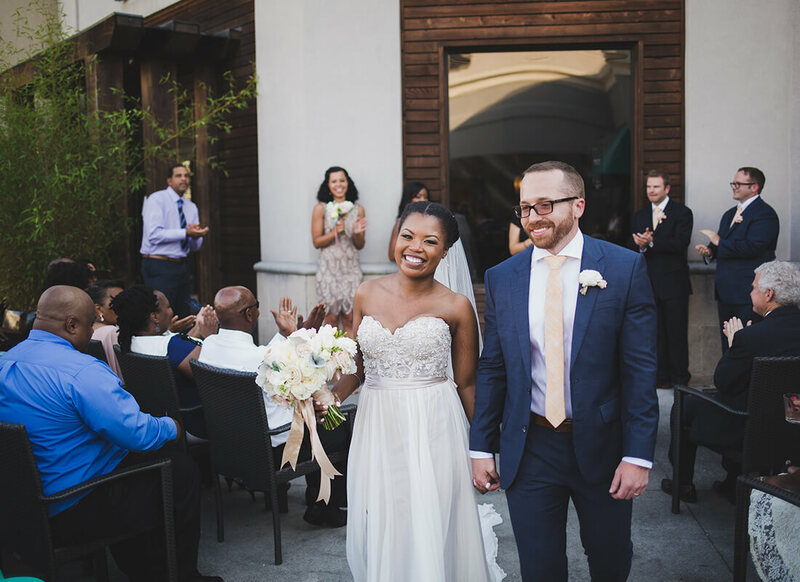 In case you're wondering, you read that correctly – Brandi and Tyler decided to get married in front of their favorite sushi restaurant and frequent date night destination! How cool is that?! 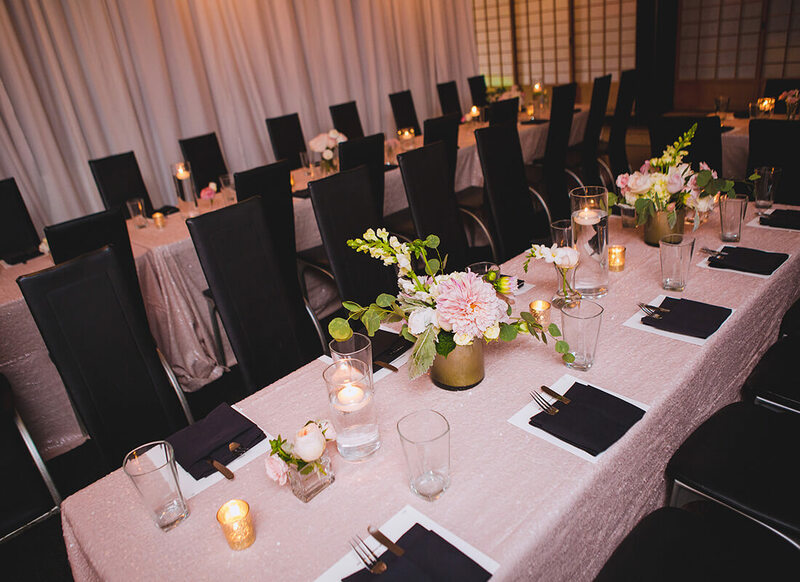 Although the destination may have been a bit quirky, this was still an elegant affair. Everything was decorated chicly, with black, white and sequined pink (the bride's favorite color) decorations. 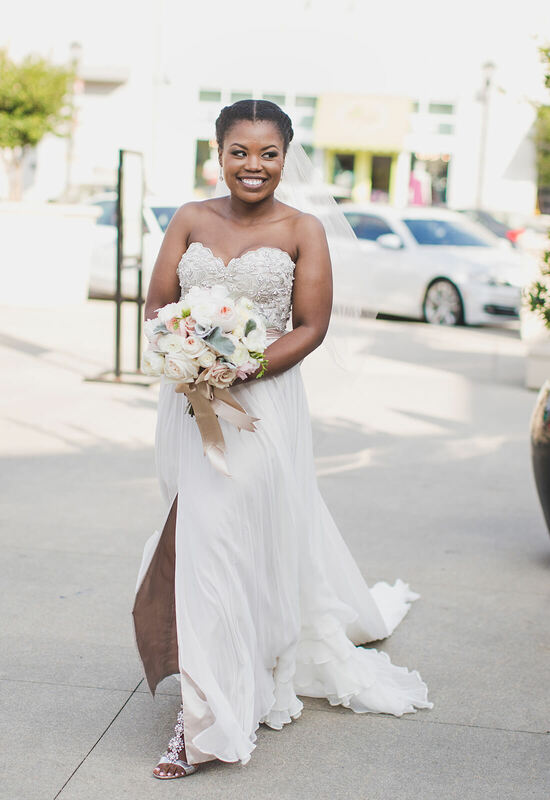 Like the atmosphere, Brandi's look was also very upscale and trendy with her hair in an elegant up-do and her floral embellished illusion corset elevating the style of her airy gown. 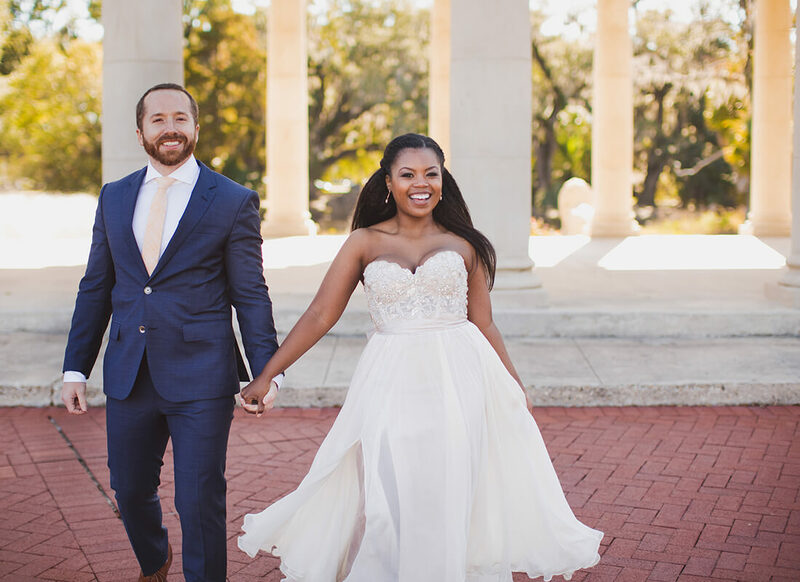 With all of the custom touches to her dazzling gown and the personalized touches to their special day, Brandi and Tyler's wedding was a wonderfully exceptional occasion. 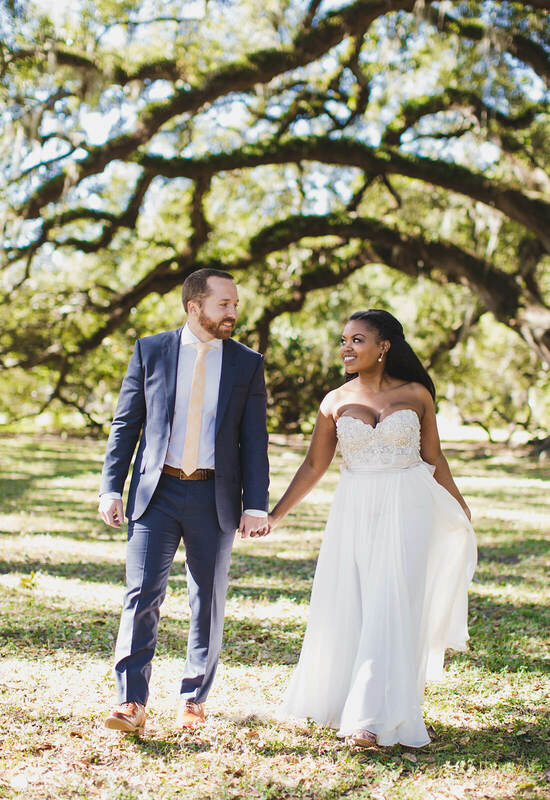 Not only was her gown a perfect reflection of her style, but their wedding was an ideal reflection of their relationship leading up to this memorable day. 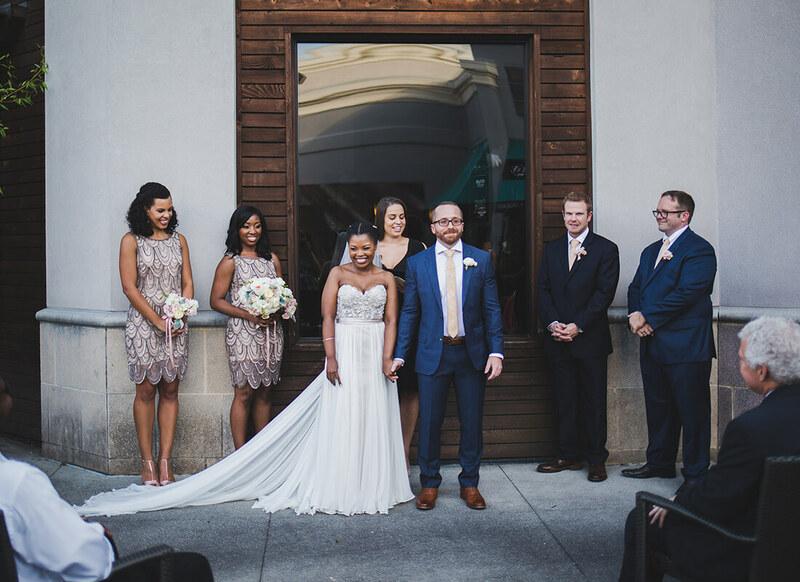 Brandi and Tyler said their “I-do's” in a fabulously quirky style and were ready to begin their own kind of happily ever after.